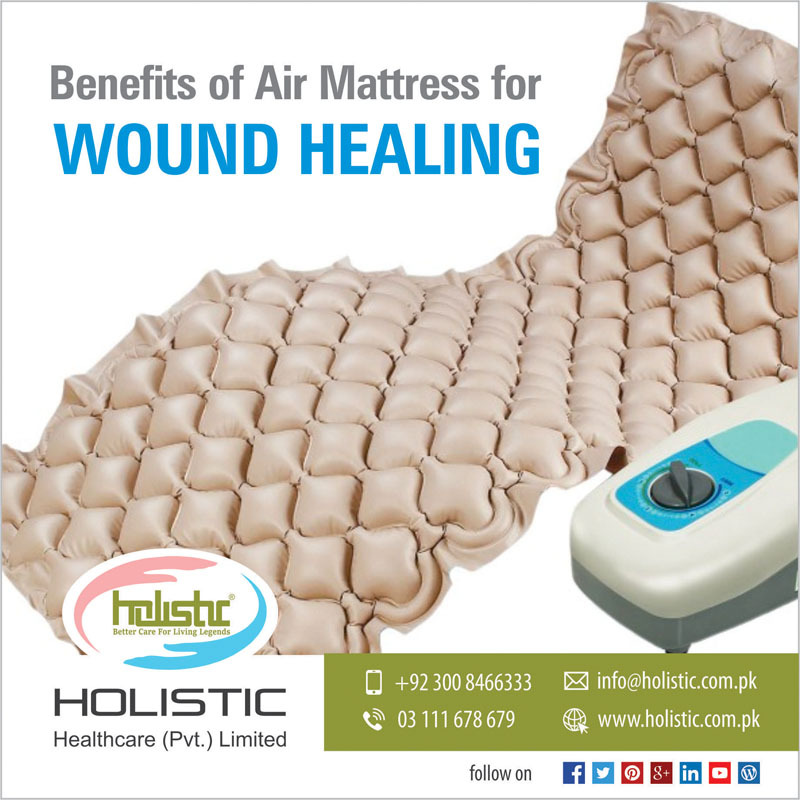 How an Air Mattress Helps With Bed Sores and Wound Healing? Wounds like pressure ulcers occur due to pressure applied on the soft tissue resulting in completely or partially clogged blood flow to the soft tissue. They most commonly develop in individuals who are not moving about, such as those who are bedridden or are mostly limited to a wheelchair. It is widely believed that other factors can influence the tolerance of skin for pressure, thus increasing the risk of wounds in the form of pressure ulcer development. Who can develop Bed Sores or Pressure Ulcers? Patients suffering from an illness that causes wounds such as pressure ulcers and patients who are totally bed ridden are likely to develop bed sores if not taken care of properly. Their care involves cleanliness or personal hygiene, daily body movement or side changes. It also depends on the place where they spend most of their time, so an air mattress is advised. An air mattress is a great source of treatment in a way that it prevents pressure ulcers and sores to develop and stops already developed ulcers from getting worse. Bed is a source of relaxation and deep thoughts for the healthy ones but for people who have limited movement due to their illness and are mostly seen on their beds, it can be very depressing and stressful. This is especially true for people who have been active all their lives, but ended up in bed as their disease worsen and cannot keep themselves stuck to it for the rest of their lives if given a choice. The choice that they get is of either lying on a regular comfortable mattress which may end up in developing pressure wounds on their backs or the part of their body that they mostly lay down upon or a fine air mattress that may help them from preventing such annoying sores. Why Use an Air Mattress? An air mattress is designed to prevent and treat pressure wounds or bed sores. It is made of multiple inflatable air tubes that alternately inflate and deflate, imitating the movement of a patient shifting in bed or being rotated by a caregiver, and not leaving the patient in one position for any extended time period. This movement of the mattress releases pressure from under the body of the patient, particularly in parts with less padding, like hips, shoulders, elbows, and heels. The air mattress ensures proper air circulation, prevention, management, and treatment of the occurrence of pressure wounds. Patients suffering from pressure wounds can experience discomfort from mild pain to extreme agony, which depends on the intensity of the wound. This can also be prevented or at least stopped from getting to its worse form with the help of proper management of the patients illness. The caregiver needs to either change the position of the patient regularly or use any prevention program that can attain even a little bit in reducing the suffering of a patient. Likewise, a high quality air mattress provided by healthcare to reduce the frequency of these unwanted ulcers and sores can also help treat them when they arise. These air mattresses ensure that patients get the rest they need on the road to recovery and prime health if not back to normal. Seeing your loved one in pain is even more painful. Surviving with illness and immobility is very challenging enough. An added stress and pain of pressure wounds might not work wonders for the patient to fight against the illness anymore but if the patient is kept comfortable enough, using low air mattresses, they may come back on the road to good health and fight even better to live better. An experienced caregiver or nurse knows exactly how an air mattress can be beneficial for the patient and they will clean any pressure sores or wounds to help with quick recovery. The experienced caregiving and nursing staff at Holistic Healthcare (Pvt.) Limited knows how to take care of a patient who has developed bed sores. Call 0300 8466333 for details. Head of Operations at Holistic Healthcare (Pvt.) Limited and Doctor of Pharmacy (Pharm-D) with a Masters degree in Public Health (MPH), I have been working as a senior professional in the Healthcare industry for the last 13 years. I have obtained a varied and diverse experience in human resource management along with marketing, medical affairs, hospital management, and team management.